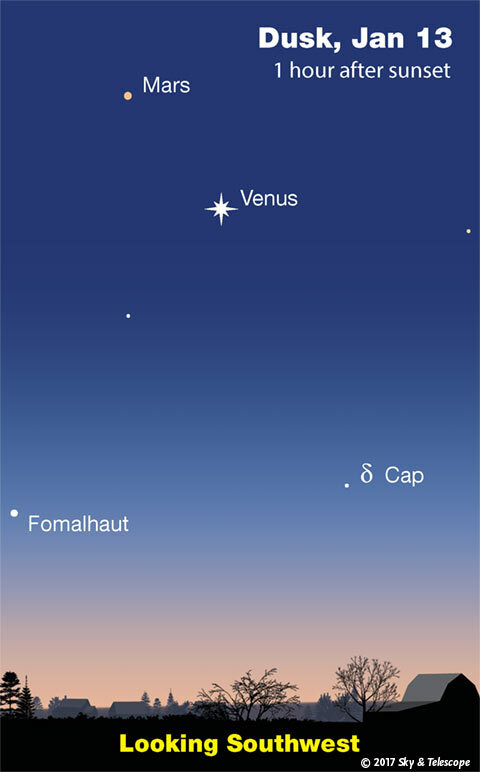 The Venus-Mars-Fomalhaut triangle continues to narrow, as Venus creeps toward Mars in the twilight week by week and Fomalhaut moves toward the lower right far below them. • How much Venus has brightened since December! It's now magnitude –4.6. Meanwhile, distant Mars has dwindled to +1.0. • Here it is the coldest month of the year, but the "Summer Star," Vega, is still barely hanging in there. Look for it twinkling over the northwest horizon during and shortly after nightfall. The farther north you are, the higher it will be. If you're too far south it's already gone. • The waning gibbous Moon shines near Regulus after they rise around 8 p.m. Watch the distance between them increase through the night, as the Moon moves east along its orbit. • In this coldest time of the year, the dim Little Dipper hangs straight down from Polaris after dusk — as if, per Leslie Peltier, from a nail on the cold north wall of the sky. • Zero-magnitude Capella high overhead, and equally bright Rigel in Orion's foot, are at almost the same right ascension. This means they cross your sky’s meridian at almost exactly the same time: around 9 or 10 p.m. now, depending on how far east or west you live in your time zone. (Capella goes exactly through the zenith if you're at latitude 46° north: Portland, Oregon; Montreal; central France.) So, whenever Capella passes its very highest, Rigel always marks true south over your landscape. And vice versa. • Orion is the brightest of the 88 constellations, but his main pattern is surprisingly small compared to some of his dimmer neighbors. The biggest of these is Eridanus the River, enormous but hard to trace. Dimmer Fornax the Furnace, to Eridanus's lower right, is almost as big as Orion! Even the main pattern of Lepus, the Hare cowering under Orion's feet, isn't much smaller than he is. • Sirius twinkles brightly after dinnertime below Orion in the southeast. Around 8 or 9 p.m., depending on your location, Sirius shines precisely below fiery Betelgeuse in Orion's shoulder. How accurately can you time this event for your location, perhaps using a plumb bob or the vertical edge of a building? Of the two, Sirius leads early in the evening; Betelgeuse leads later. Welcome to pre-telescopic astronomy. • The Moon, nearly last-quarter, rises around midnight tonight in the company of Jupiter and Spica; they're only a few degrees apart. By the beginning of dawn on Thursday morning the 19th, the bunch of three is standing in proud view high near the meridian, as shown at right. • The deep, flat-bottomed eclipsing binary star RW Tauri drops from 8th to 12th magnitude and back tonight, centered on 11:20 p.m. EST. See the observing project in the January Sky & Telescope, page 48. • Last-quarter Moon (exactly so at 5:13 p.m. EST). 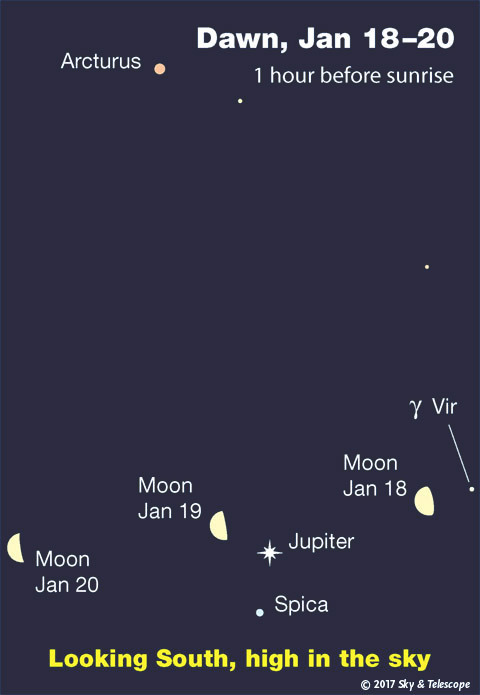 The Moon rises around midnight or 1 a.m. tonight, now to the lower left of Jupiter and Spica. By dawn Friday morning they're again high in the south, with the Moon well left of Jupiter and Spica, as shown here. • After dinnertime, the bright, equilateral Winter Triangle glitters in the southeast. Sirius is its brightest and lowest star. Betelgeuse stands above Sirius by about two fists at arm's length. To the left of their midpoint is Procyon. • Is your sky dark enough for you to see the winter Milky Way? After dinnertime now, it runs vertically up and across the zenith: from Canis Major low in the southeast, up between Orion and Gemini, through Auriga and Perseus almost straight overhead, and down through Cassiopeia, Cepheus, and Cygnus to the northwest horizon. • Early in the dawn of Sunday the 22nd, spot the waning crescent Moon hanging in the southeastern sky. Some 12° below it (for North America) is Antares. Look 15° to the left or lower left of Antares for Saturn. The same distance lower left of Saturn is Mercury. Want to become a better astronomer? Learn your way around the constellations! They're the key to locating everything fainter and deeper to hunt with binoculars or a telescope. The Pocket Sky Atlas plots 30,796 stars to magnitude 7.6 — which may sound like a lot, but it's less than one per square degree on the sky. Also plotted are many hundreds of telescopic galaxies, star clusters, and nebulae. Shown above is the new Jumbo Edition for easier reading in the night. Click image for larger view. Once you get a telescope, to put it to good use you'll need a detailed, large-scale sky atlas (set of charts). 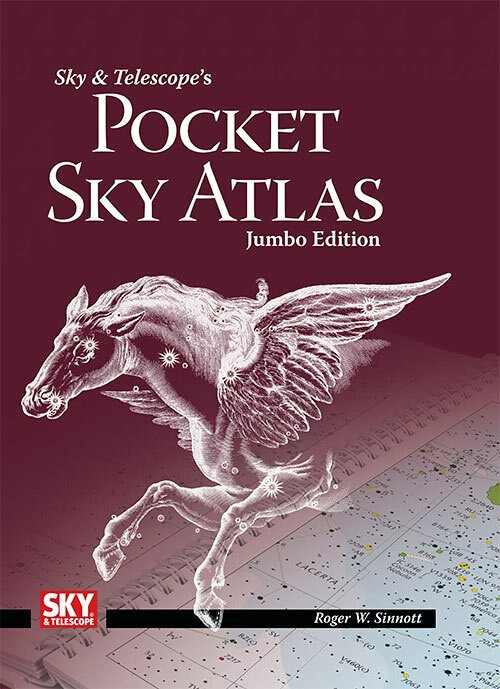 The basic standard is the Pocket Sky Atlas (in either the original or new Jumbo Edition), which shows stars to magnitude 7.6. Next up is the larger and deeper Sky Atlas 2000.0, plotting stars to magnitude 8.5; nearly three times as many. The next up, once you know your way around, is the even larger Uranometria 2000.0 (stars to magnitude 9.75). And read how to use sky charts with a telescope. You'll also want a good deep-sky guidebook, such as Sue French's Deep-Sky Wonders collection (which includes its own charts), Sky Atlas 2000.0 Companion by Strong and Sinnott, or the bigger Night Sky Observer's Guide by Kepple and Sanner. Can a computerized telescope replace charts? Not for beginners, I don't think, and not on mounts and tripods that are less than top-quality mechanically (meaning heavy and expensive). And as Terence Dickinson and Alan Dyer say in their Backyard Astronomer's Guide, "A full appreciation of the universe cannot come without developing the skills to find things in the sky and understanding how the sky works. This knowledge comes only by spending time under the stars with star maps in hand." Mercury and Saturn are low in the southeast in early dawn. Mercury (magnitude –0.2) is sinking lower from day to day, while Saturn (magnitude +0.5) is getting higher to Mercury's upper left. They widen from 7° to 13° apart this week. Antares, magnitude +1.0, twinkles 14° or 15° to Saturn's right or upper right. Mars and Venus creep closer, but at an ever slower rate. They will never pass this season; they'll be closest, 5½° apart, in early February, and then Venus will begin to drop away. Venus is the brilliant "Evening Star" this winter, high in the southwest during and after twilight. It's currently magnitude –4.6, in eastern Aquarius. To its upper left is Mars, an orange speck by comparison. In a telescope Venus appears very nearly half-lit, and it's growing larger as it approaches us: it's now 25 or 26 arcseconds from cusp to cusp. For the rest of the winter, Venus will continue to enlarge as its phase wanes down to a thin crescent. Venus in a telescope is least glary when viewed in bright twilight, so get your scope on it as soon as you can see it naked-eye. 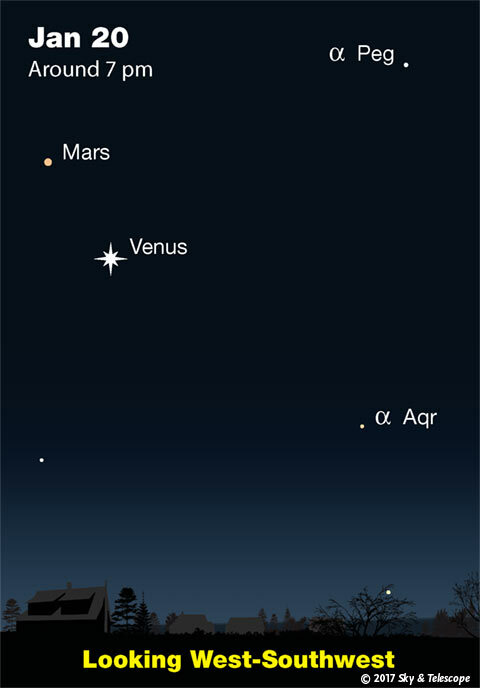 Mars (magnitude +1.0) is the fainter "star" upper left of Venus. The separation between them shrinks from 8° to 7° this week. In a telescope Mars is just a tiny fuzzblob 5 arcseconds in diameter. Jupiter's Great Red Spot side on December 31st, imaged by Christopher Go. Also note small, pale-orange Oval BA upper left of the Great Red Spot. South is up. Jupiter (magnitude –2.0, in Virgo) rises around midnight and shines brightly high due south before the first light of dawn. Spica dangles 4° below it. Jupiter is creamy white, but Spica is an icier shade of white with a trace of blue. In a telescope Jupiter is 37 or 38 arcseconds in diameter, not very large for Jupiter; it still has a long way to go until its opposition April 7th. Uranus (magnitude 5.8, in Pisces) is high in the southwest right after dark. Neptune (magnitude 7.9, in Aquarius) is drawing away from Venus this week. On January 13th they're still only about 0.4° apart for North American observers, with Neptune to Venus's lower left in the sky. Use high power to try to discern its 8th-magnitude disk — which appears barely nonstellar with a diameter of just 2.2 arcseconds. Their separation widens by 1° per day after that, with Neptune moving down to the lower right. Here are Finder charts for Uranus and Neptune among their background stars. 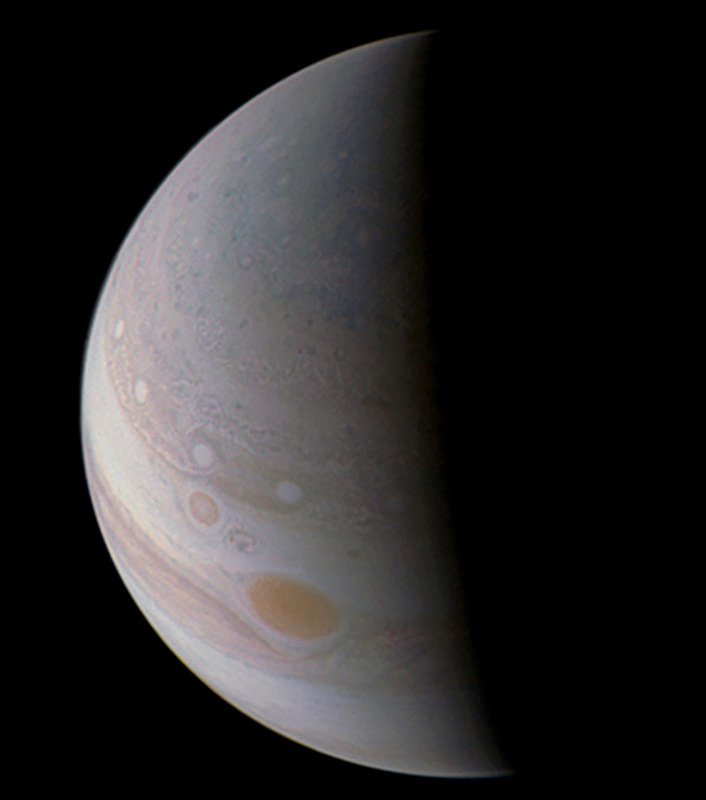 Jupiter as imaged by NASA's Juno orbiter on December 11, 2016, as Juno receded from the planet after its third close pass. Damian Peach processed and assembled raw images to produce this view. South is again up. In the 20 days between this image and the one above, notice how Oval BA ("Red Spot Junior") shifted with respect to the white ovals poleward of it, and how all shifted slightly with respect to the Great Red Spot. Jupiter is always on the move. All descriptions that relate to your horizon — including the words up, down, right, and left — are written for the world's mid-northern latitudes. Descriptions that also depend on longitude (mainly Moon positions) are for North America. Eastern Standard Time (EST) is Universal Time (UT, UTC, or GMT) minus 5 hours. "This adventure is made possible by generations of searchers strictly adhering to a simple set of rules. Test ideas by experiments and observations. Build on those ideas that pass the test. Reject the ones that fail. Follow the evidence wherever it leads, and question everything. Accept these terms, and the cosmos is yours."